I’ve never really enjoyed puddings. Maybe this is because my parents weren’t big fans of them either and managed to share this with the family? In lieu of puddings, i find brownies are the best winter warmers. It’s hard to resist eating all the batter before it’s been poured into the tin, but when it comes out of the oven, that chewy, nutty chocolate dessert is definitely worth it on a cold winter’s evening. Although in my home we never really had dessert (unless it was a special occasion), I find now as an adult and living away from home, I crave something sweet at the end of a meal. My current housemate and I occasionally (more frequently on a cold winter’s night) make a quick and simple chocolate self-saucing pudding that is cooked in the microwave. It is so yummy and warming! Instantly hits the spot! My mum makes an apple and rhubarb crumble and it is just to die for. It’s heaven when it has just come out of the oven- nothing better on a cold winter’s night. Especially with a couple of scoops of ice-cream. A quick and really simple winter dessert that I make is a mug cake. It basically takes five minutes to whip up the flour, sugar, cocoa, egg, milk and oil and add in some chocolate chips. This is all poured into a mug and microwaved for a couple minutes. It’ll probably explode over the edges though! Serve with ice-cream, cream or a nice warm sauce! I remember my mum making an apple pie once in a while. Back then I didn’t actually eat it, I only started liking it in the past few years. Recently I went to Hawaii and I was lucky enough to be there for Thanks Giving. I tried my first pumpkin pie and also a pecan pie. I fell in love and I have attempted to make the pumpkin pie at home but unfortunately they pumpkin wasn’t the best quality and the pie didn’t work out too well. Even though it isn’t a pudding, my favourite winter dessert is fresh home made custard. Growing up my mum had a bread machine and would make bread. This was really great but it went stale quickly so we would use it up in bread and butter pudding when we decided it was not good for sandwiches anymore. I have since tried rum and raisin bread and butter puddings and even a chocolate bread and butter pudding. 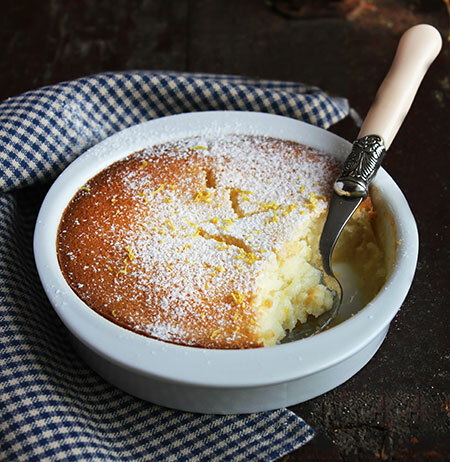 Definitely want to try out a lemon delicious pudding! While not particularly fancy, Bread and Butter Pudding is a favourite of mine. I usually add sultanas to mine which plump up all nice and juicy during the resting & baking and add a little bit of extra sweetness. I remember making it regularly growing up as it had such simple ingredients that we always had on hand at home. Plus it was a great way to use up eggs when my parents’ chickens were laying an abundance of eggs for us. Although it’s not a pudding, the good old fashioned apple crumble would have to be my favourite dessert during winter. Serve with quality vanilla bean ice cream or whipped cream. I remember making apple crumble in Home Economics many decades ago at secondary school. I was so impressed with my efforts that every time we had visitors around our place I would always show off my cooking skills and make this for our guests. I loved creamy vanilla rice pudding, cooked on the stove top with whole cinnamon sticks, condensed milk and lemon zest. Delicious.